When a car-loving Canadian police officer pulled over a group of exotic supercars on a road rally, he didn’t write a ticket, reprimand anyone, or even give out a warning. 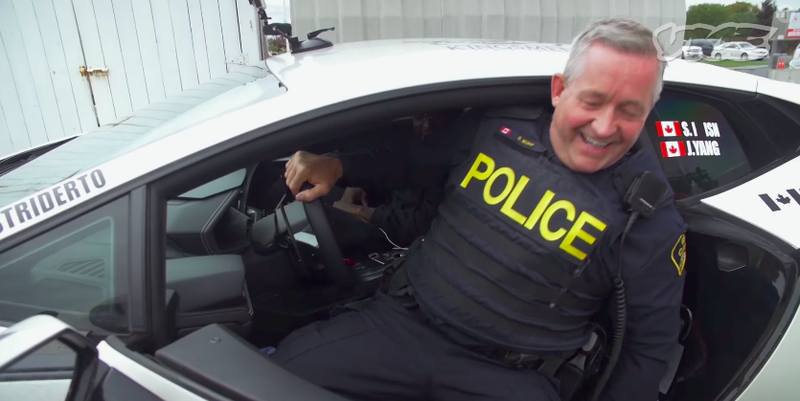 To thank the cop for his kindness, a Lamborghini Huracan owner let the officer take the supercar around the block; the resulting video will make any car-nut’s heart melt. The cop was careful not to lean on the car, assured Ghostrider there would be no ticket, and just asked the driver to tell the rest of the rally group to move over in the lane to let other motorists go by. He looked at Ghostrider’s license, and then complimented the high-dollar Lambo before preparing to go on his merry way. It’s a hilarious little test drive, too, with the officer saying “I don’t think [my boss] is gonna like this,” and clearly having an internal struggle as he unsuccessfully tries to find the turn stalk. “I just failed to signal,” he says, perplexed by this ridiculous machine. If only my police encounters were so pleasant. But then, I’m not sure any officer would want to drive one of my junkers.